First firm to have converted to LLP, now (probably) first Indian firm with four managing partners. Managing partner Preeti Wahi Batra - a 1994 Delhi University law graduate, who is also Hemant Batra’s wife - will head the financial transactions-related legal advisory vertical, as well as be responsible for the firm’s administration. “She’s adding a lot of value to commercial documentation plus she is also taking care of administration”, said Hemant Batra. Managing partner Amiya Ranjan Nayak - an Utkal University graduate who had been with the firm since 2005 - will head up the real estate and commercial law practice. Nayak had “mastered the art” of real estate work, said Batra. Managing partner and Supreme Court advocate Aditya Shankar, a 2008 Delhi University LLB with a 2010 LLM from Cornell Law School, is now heading the firm’s litigation and disputes vertical. “We don’t have very many briefs in litigation, because we are very selective but we really want to grow litigation as well,” Batra noted. Kaden Boriss had closed its active disputes practice in 2013, following the death of senior partner Ali Naqvi in a car accident caused by a drunk driver. Shankar had restarted litigation at the firm in 2017, with a small separate office in Delhi’s Bengali Market, which now houses four lawyers, including himself. Finally, Swati Sharma Sulalit - a 2008 NLU Jodhpur graduate who had joined Kaden Boriss in 2015 after stints at Tata Capital, Apollo Tyres and Moody’s - will be managing partner of the corporate, private equity and transaction law practice. She was “representing really good clientele”, including a number of “prominent” start-ups, such as Urban Clap, Benori, CoinTribe, Mercurio Pallia, MetalMan and and Cars24, which were clients of the firm. “These guys have done really well," Hemant Batra said, noting that the the promotions had “not been made purely from the perspective of marketing strategy or designation strategy”. Regarding his plans to do less hands-on transactional work and to take a back-seat to the firm, Batra joked that he had gone through a bit of a “midlife dilemma with the same old work routine”. “I don’t brand myself as a partner, more as a chairperson now - and am not at all involved in the day-to-day. Wherever the client insists, I might stay present in the meeting for a while so the client gets a bit of comfort, but [others will manage the deals],” he said. At Kaden Boriss, meanwhile, the promotions have increased the number of partners to 5 (out of a total of 15 fee-earners), although only Hemant and Preeti Wahi Batra hold brand ownership equity. 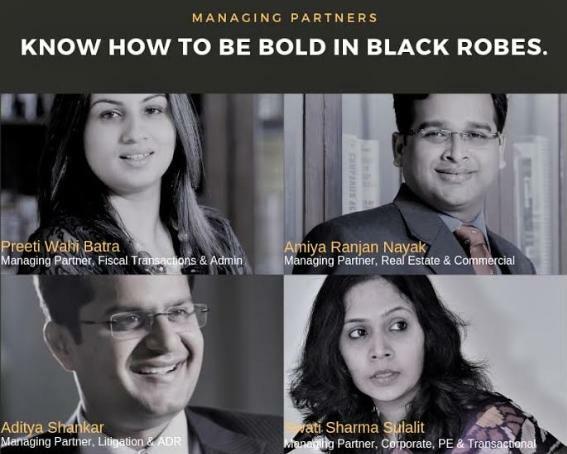 Hemant Batra explained that the present model had evolved over the years, after the firm had been one of the first in India to set up as a Limited Liability Partnership (LLP) model in 2009. In 2009, it had promoted four partners into the structure. However, one Bar Council of Delhi notice a short time after that, which claimed the LLP structure was not permitted for law firms, Batra decided to scrap it on the advice of a senior lawyer. ,,”,,I never wanted to take it head on,” he said about the bar council’s notice. After dabbling with full partnership - which proved to be a complex and “tedious process” whenever a partner retired, according to Batra - Kaden Boriss’ partnership now was a contractual arrangements between partners with the Kaden Boriss entities, where individual partners were entitled to between 30 to 70% of their invoiced amounts. Correction: The initially published story stated that the ratio was between 50 to 70%. And, notably, the firm’s computer system meant that partners were always paid within 24 hours of their invoices being submitted, Batra added. However, the firm’s brand “does not have Batra or Hemant attached to it - we want them to feel that the brand is theirs”, he said. Unlike his music, of course. He has been recording and distributing on iTunes and similar platforms under the name Urf Hekbat (YouTube link), the latter part of which is a portmanteau of Hemant K Batra. Now that he is taking a back seat, would be mind conducting the moot which was promised to happen in 2013..but was cancelled indefinitely? Students (now all graduated, including me) had put a lot of effort in preparing memos. Atleast Kaden Borris should apologise for their laxity. LI - please publish this comment. There is nothing factually incorrect in my comment - you can get it verified by Mr Hemant as well. But, does any one care about any moots here? Which kind of college would keep a kaden borris moot? Had forgotten all about that. Thanks for the laugh! Mr. Batra aka Urf Hekbat's music is as wonderful as Mr. [...]'s lawyering. Congratulations! I don't know about his abilities as a lawyer but I did end up liking one of his track. Though, there is still a lot of work which needs to go there. Urf Hekbat, time to burn some midnight oil bruh! I would love to get the photographer's coordinates, I need a new picture for my linked-in profile. These guys have clearly nailed it. Coordinates? Are you going to hire them or order a drone strike? Batra is ex amarchand and has authored books on due diligence bad FDI. He is good lawyer and I think it was too early for him to quit domestic legal work. I assume he into foreign cross border legal work. So now the "hardworking" lawyer will post pictures from the new(est) office?? Or will be it still pictures with the usual goon squad? Congratulations to all new Managing Partners!! ..where can I meet Mr. kaden and Mrs Boris ? I like Chameli's comment Mr Kaden and Mrs Boriss. Hilarious. I did some LinkedIn and other Social Media etc. research on Batra in specific and Boriss Kaden in general. The man himself Batra is a good orator. I think law firm is doing more of consulting and documentation work. Anyway congratulations to new blood of the firm. Swati Sharma appears to be a good lawyer.